If you're looking for a decadent and chocolate dessert, look no further. This Double Chocolate Cheesecake is heavenly and I have no shame admitting that I had a small slice with breakfast this morning! 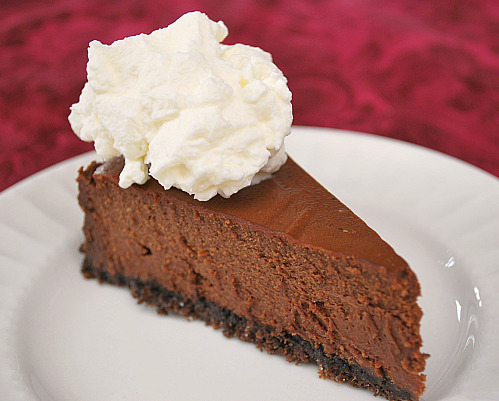 Rich, creamy, smooth chocolate cheesecake is nestled into a delicious chocolate cookie crumb crust... it's so simple, it's practically foolproof. The key to this recipe is the use of both unsweetened and semi-sweetened chocolate in the filling. Together, it creates a not too sweet cheesecake filling that's just perfect. Top with a dollop of fresh whipped cream and add some fresh berries if you'd like too. For the crust: Mix the crust ingredients together and press into bottom of springform pan; set aside. For the cheesecake: Mix cream cheese and sugar with electric mixer until well blended. Add eggs and continue mixing. Add melted chocolate until fully incorporated. Pour mixture over the prepared crust and smooth out top with a spatula. Place in the preheated oven and bake for 55 minutes or until center of cake is almost set. Loosen the cake from rim of springform pan - Do not remove rim of pan until cool. Refrigerate the cheesecake for one day or overnight before serving. Garnish with fresh whipped cream if desired. YUM!! I've never actually made a chocolate cheesecake! I think it's high time I did! Thanks for a great looking recipe! I'm no baker, but this looks so easy I think even I could manage it LOL. Thanks for sharing this yummy dessert with us. Just put one in the oven! It was not difficult! Will comment later on the results! Joelen, I made this for a class I held today and EVERYONE LOVED it! I was a little concerned because the batter tasted a little more of the unsweetend (bitter) chocolate, but it turned out so well! And it was so easy! Thanks for sharing this and tell your friend thank you for a wonderful recipe!